Anyone, who aspires to a career as a radio artist, entertainer or announcer is an ideal prospect for your sound recording services. By practicing before a recording microphone, these amateurs can listen to their own performances and thereby determine where improvement is necessary. Teachers of music, singing, public speaking and foreign languages recognize the value of recordings in making it possible for pupils to hear themselves. Since most teachers cannot afford to own a complete recording system themselves, they are excellent prospects for a recording service and should be considered in your market survey. School teachers specializing in speech correction likewise find a recording service invaluable. Successful radio artists occasionally desire to have recordings made, so they can hear exactly how they sound over the air. Many orchestras today secure engagements In distant cities simply by having high-fidelity recordings made of a number of selections and sending, these recordings as samples of their work. Orchestra leaders are generally willing to pay liberally for this service, since it eliminates the necessity of having the entire orchestra make it long trip on the mere chance of securing an engagement. Recordings of speeches or of entire programs at important local celebrations in a community can often be sold to the sponsors of the celebration or to those participating. Class plays and other dramatic productions, as well as locally produced concerts, can likewise result in business for the owner of a portable recording system. Sound recordings of entire wedding ceremonies are rapidly becoming as much a part of the getting married procedure as are wedding photographs. Few indeed are the young couples who will turn down an opportunity to secure a living record of this all-important event. Messages of congratulations, holiday greetings or simply cheery words of conversation are being recorded extensively today, and the finished discs sent to friends and relatives in distant places. Far superior to written messages or photographs are these vocal messages, for every inflection of the voice and every word is clearly distinguishable. Many parents are recording the voices and songs of their children to preserve for play-back in future years and to treasure along with childhood snapshots and bronze-plated baby shoes. The field of criminology should also be considered. There is a demand for portable recorders among lawyers, who often desire to record secretly the conversations in a room or location for use as evidence in lawsuits and divorce cases. Detectives and other police officials often rent recorders for use in recording conversations of criminals when it is impractical for the detective to hide in the room. Confessions of criminals, recorded with every inflection of. the voice, often carry far more weight in court than even signed written confessions. Recorders are also being used for court reporting purposes, making permanent records of every word spoken during a trial. Radio advertisers on local stations often desire to have recordings made of their programs; as broadcast, to preserve for reference purposes, for improvement of the program, or as evidence that they are entitled to a refund in the event that the program is not handled properly by the broadcast station. An ordinary radio receiver of fairly high fidelity is used to bring in a desired program when it is to be recorded. 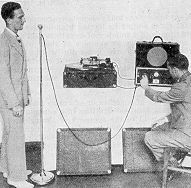 Oftentimes radio fans themselves will desire to have particular programs, such as the speeches of the president and of other notable people, or special broadcasts in which they are particularly interested, recorded so they can be played back at any desired time in the future. This list will undoubtedly suggest to you numerous other uses for modern portable sound recording equipment in your particular locality. There is every reason to believe that recording can be a profitable side-line if you are located In a fairly large city or in a smaller city where unusual industrial, business, entertainment, educational or governmental activities may result in a greater than normal demand for your services.